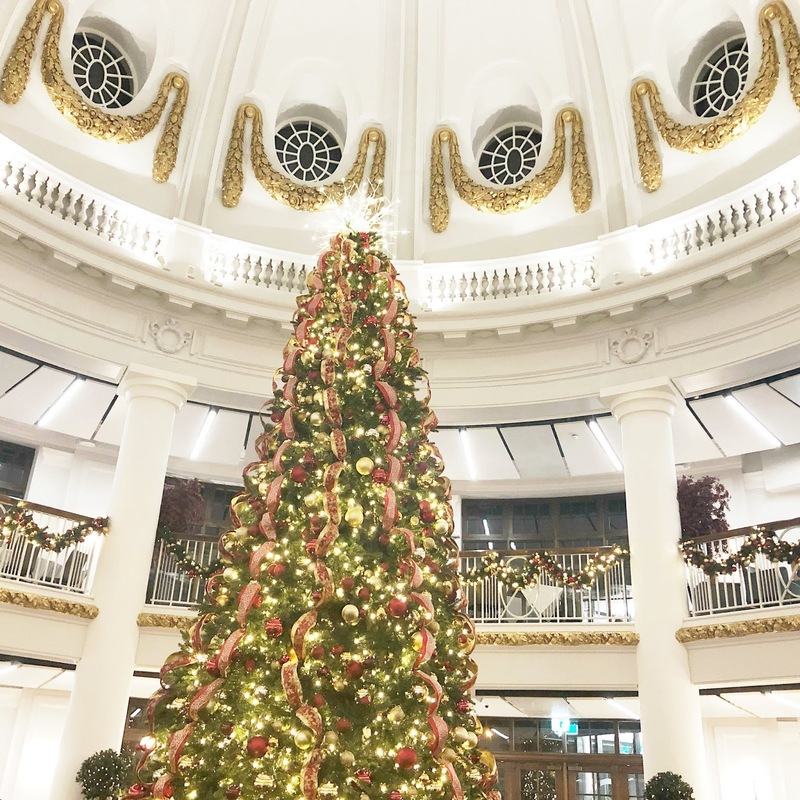 If you've been following all of our adventures this year it'll come as no surprise to you that when it came to picking a location for a Christmas adventure there was only one place we wanted to head - Whitley Bay! Although Christmas at the Coast for some may seem a little extreme (the chill off the North Sea in the Winter is definitely bracing), an evening in Whitley Bay was long overdue for us and I was determined to see her in all her glory over the festive period. 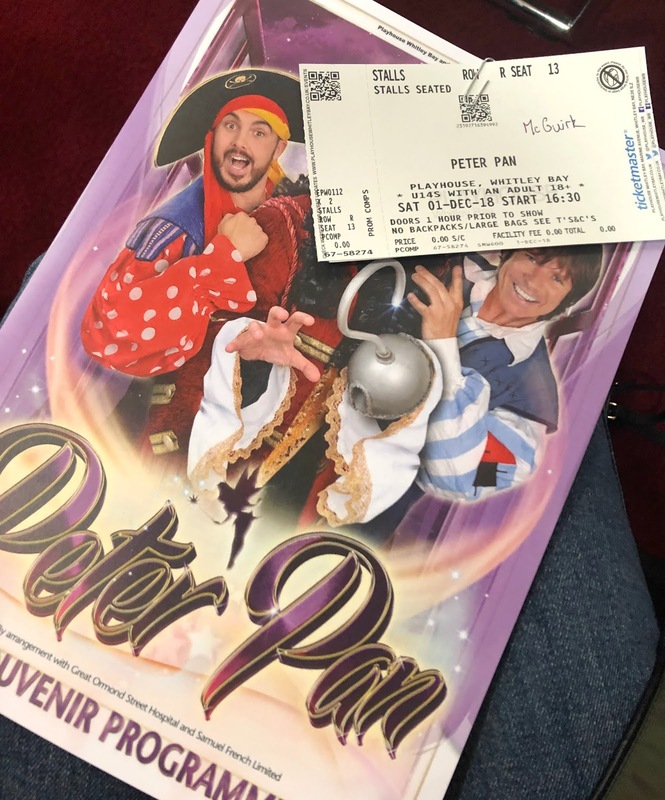 Our trip to the coast began with our first ever visit to The Playhouse for this year's Pantomime (can you believe that despite being a huge fan of Whitley Bay I'd never been to the theatre there before?) - we were invited to quite a few pantomimes this year but with a very busy diary only had the time to choose one to go to and of course it had to be Whitley Bay for us. You may be wondering why two grown adults with no children are going to the Pantomime but I personally think that the joy and silliness of a Pantomime is perfect for all ages at this time of year. Christmas is all about letting yourself go, embracing your inner child and recapturing the magic you felt all those years ago. I just love a good Pantomime to kick off my Christmas season and with so many to choose from in the North East we really are spoilt for choice. This years Pantomime at Whitley Bay is Peter Pan and as well as featuring Playhouse favourite Steve Walls (returning for the ninth year!) the show also stars Antony Costa from Blue as Hook. As much as it makes me feel old that the boyband members of my youth are now on the Panto circuit I have to say I do love a good noughties throwback and Anthony was surprisingly good as the Panto villain (and the little Blue medley at the very end of the show was so much fun). We've been to a fair few pantos in the North East and I'd say that some appeal more to adults than others and the Playhouse Panto is very much aimed at very young children with perhaps too many cheesy Dad jokes, some very loud high pitched screaming from the audience and a sing along to Baby Shark (which I couldn't get out of my head for days after - you have been warned). So whilst I can't really recommend it as a pantomime to enjoy as adults if you're after a really fun afternoon for the youngest members of your family then I really can't fault it. The young children sitting around us were having a great time and I can see why so many locals return every year as part of their family Christmas tradition. 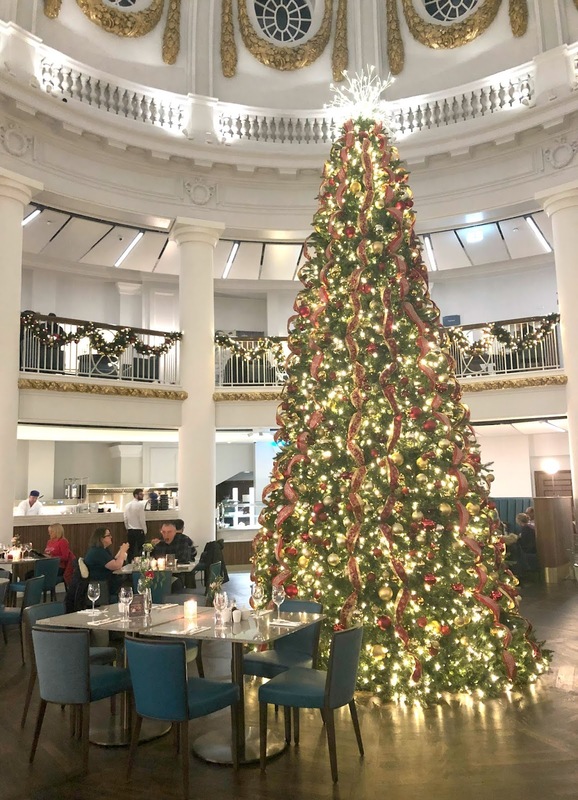 After hearing so many great things about the fish at Trenchers under the Dome we decided to eat there and, despite there being a fair few people already dining, they managed to find us a table for two right by the Christmas Tree. Wow, that Christmas Tree really is something! 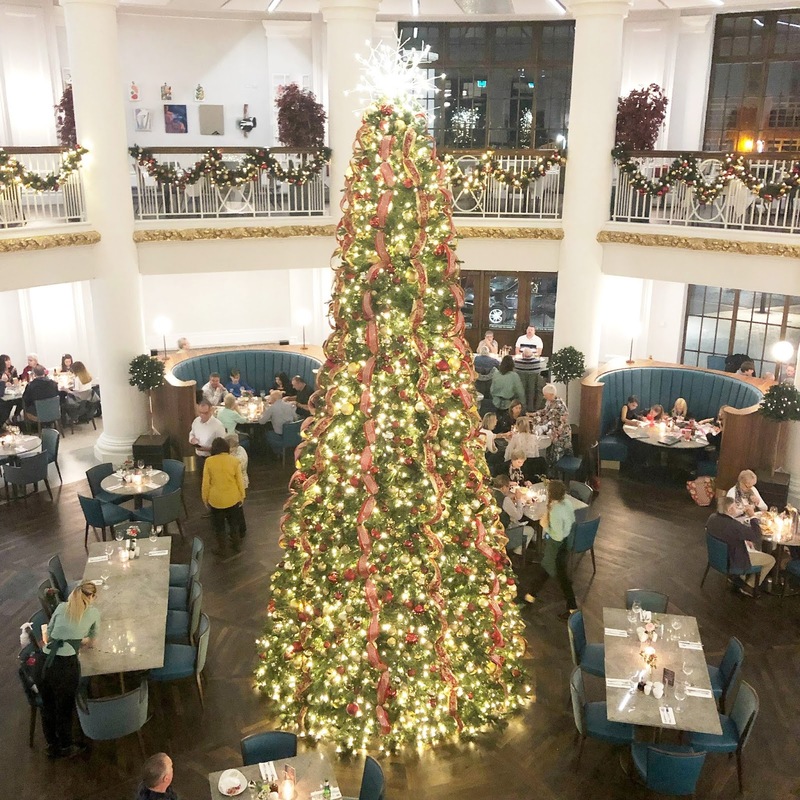 It has to be the most impressive tree in the North East, it towers over diners in Trenchers beautifully decked out in red and gold with hundreds of twinkly fairy lights. Enjoying our dinner in such spectacular surroundings was made even better when a pianist arrived to treat us to an evening of live music, suddenly our quick bite had turned into a fancy affair, there's just something so romantic about Spanish City. Trenchers are famed for their fish and chips so we both decided to go for fishy dishes to get the proper experience. Simon went for his childhood favourite, Scampi served with Lemon, Chips and Tartare Sauce (£11.95) and I decided to go for Cod. 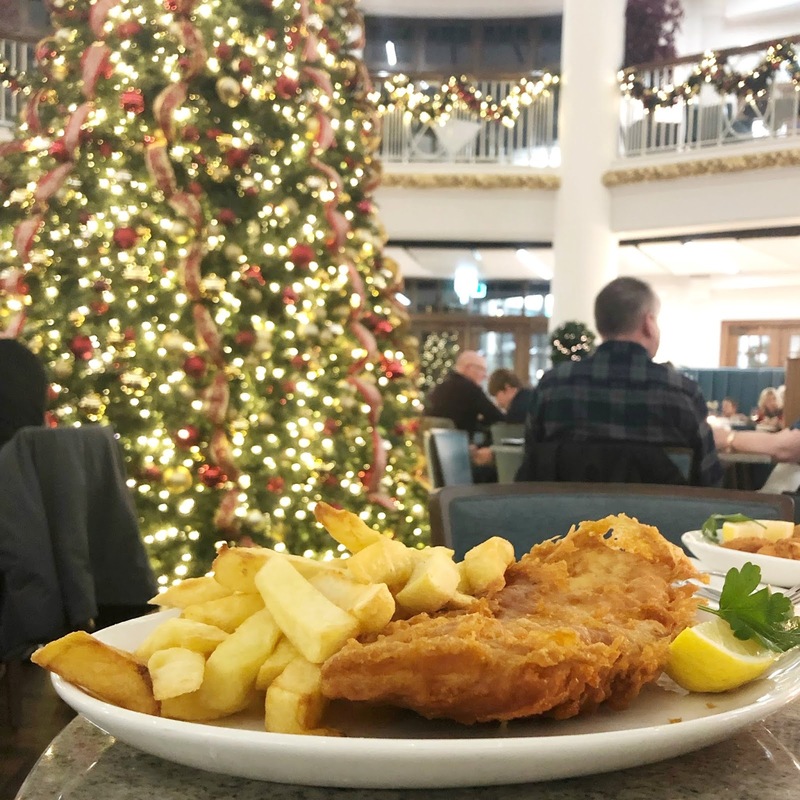 The Cod at Trenchers comes in three different sizes - Small (£9.95), Regular (£11.95) and Large (£13.95) and comes served with Chips, Lemon and Tartare Sauce. Feeling pretty hungry I decided to go for the regular size and was quite surprised at how generous the piece was when it turned up in front of me. There's no way I would have managed a large! Of course, we also had to order Mushy Peas on the side (£1.00) which were the perfect addition to our meals. It's also worth noting (and unfortunately we didn't realise this before our trip) that if your visiting Trenchers on the same day as the Playhouse you can get 20% off your meal if you show your theatre ticket. I'm very happy to report that all the great reviews we've heard about the fish and chips at Trenchers are completely true, our meals were faultless and we both agreed that having such a fantastic meal has really made Spanish City one of our favourite spots in the North East. We're now desperately trying to clear our diaries so that we can return for their amazing festive afternoon tea or perhaps some drinks. If you're looking for a truly beautiful way to celebrate Christmas this year I can't recommend Spanish City enough! If you fancy seeing this year's Pantomime at the Whitley Bay Playhouse, Peter Pan runs until 5 January and you can find out more about dates, times and how to book tickets here. There's plenty going on at Spanish City this Christmas including party nights, live music and festive afternoon tea. We received two complimentary press tickets to the Pantomime but our meal and drinks at Spanish City were paid for by ourselves. It is so lovely, one of my favourite places! Can't wait to try some more of the food! I am very excited about your Christmas afternoon tea! It's stunning isn't it? I'm honestly so obsessed with Whitley Bay, I'd go every weekend if my husband would let me! It's a real beauty isn't it!